The land on which Camp sits was part of the 1708 Hardenburgh Patent, of which Robert Livingston was an early patent holder. In 1775, his descendant Gertrude Livingston, wife to Morgan Lewis (Major-General in the Revolutionary War, New York Governor from 1804-1807, and son of Frances Lewis, signer of the Declaration of Independence) was given 19,000 acres from her father, Robert R. Livingston. Shortly afterwards, they constructed the Lake House on the shores of Lake Delaware, where they began spending their summers. In 1850, Gertrude and Governor Lewis’ granddaughter Louisa Mathilde Livingston married Commodore Elbridge Gerry (called Commodore from his years leading the New York Yacht Club) and, upon the death of Louisa’s father Robert J. Livingston in 1891, the Lake Delaware Estate passed into the Gerry family, where it remains to this day. In the early 1770s, Elbridge Gerry, a wealthy cod merchant in Marblehead, Massachusetts, was elected to represent that state at the Constitutional Convention in Philadelphia. His political acumen and dedication to the rebel cause resulted in his signing of the Declaration of Independence. Afterward, he served as Governor of Massachusetts and Vice-President under President James Madison from 1810-1812. Descendants of his also held public office, including Elbridge Gerry, a congressman from Maine in the mid 19th century, and Senator Peter Gerry, who served as senator from Rhode Island for 24 years, until 1946. As legal counsel to the American Society for the Prevention of Cruelty to Animals (ASPCA), Commodore Gerry became aware of a child abuse case and discovered that, unlike animals, there was no law prohibiting the abuse of children. Alarmed, he and his colleagues founded the New York Society for the Prevention of Cruelty to Children (NYSPCC) in 1875 as the world’s first such society for the protection of children. In 1886, E. H. Harriman (organizer of Union Pacific Railroad) and father-in-law to LDBC founder Robert L. Gerry, decided to start the Boys’ Club of New York to encourage young boys from poor families to spend their time after school in a productive uplifting manner. The Gerry family supports and remains involved in these charities to this day. In 1909 Robert Livingston Gerry creates a summer camp to “provide a summer in the country for a boy who could not otherwise afford one”. Inspired by his father’s work with the NYSPCC, Robert L. Gerry, with the support of his wife Cornelia Harriman Gerry, founded a summer camp for boys who could not otherwise afford to attend one. The first session of camp included 100 boys from New York City and was at a farm in Bovina. For the next two years, land was leased at nearby Tunis Lake. In 1912, Mr. Gerry purchased a local farm as a permanent campsite and constructed the mess hall, armory and St. Joseph’s Chapel. The camp then took the name Lake Delaware Boys’ Camp, after the lake that is the center of the Lake Delaware Estate. Mr. Gerry’s father, Commodore Elbridge Gerry, donated his pipe organ at the Lake House to the newly constructed chapel. Never electrified, to this day campers vie for the opportunity to turn a large wheel in the pump room to push air into the bellows allowing the organ to play. The organ, built by Teddy Roosevelt’s cousin Hilborne Roosevelt in 1877, is known among organ enthusiasts as being among the most historic and well- preserved pipe organs in the country. A major restoration effort supported by hundreds of people was undertaken in 2014. Initially, campers came from the Big Brother movement, of which the brothers Robert L. Gerry and Senator Peter Gerry were directors, and, later, from choirs in Episcopal churches in New York City. Mr. Gerry arranged for a clubhouse in New York City to continue year round the camaraderie and instruction to the campers. Eventually the clubhouse settled on 14 East 109th Street, adjacent to the Church of St. Edward the Martyr, where it remained until the early 1960s. A tradition soon began of annual dinners for campers and alumni and in 1910 it was reported by the Andes Recorder that Christmas Day dinner consisted of mock turtle soup, celery and pickles, roast turkey, pumpkin pie and demi tasse! Many alumni have fond memories of heading to the clubhouse after school or on weekends to play sports with fellow campers and eat full meals, especially on Thanksgiving. Probably the greatest influence on LDBC, with the exception of Mr. Gerry, was James L. Whitcomb. He became the camp director in 1914, establishing the academy structure and its military style parades such as those seen at West Point. Gov. Whitcomb’s imprint on the camp program lasts to the present day. The LDBC program begun by Gov. Whitcomb divides campers into two companies, A and B, which compete by age group throughout the season. The camp day begins with a bugle blowing First Call, followed by exercise, the Pledge of Allegiance and chapel. In the evening, before dinner, campers line up for Police Call, so tacs (counselors) can make sure they and their tents are clean. Each Sunday afternoon, campers parade and show off their drill movements and musical ability in the camp band. At the end of each camp season, all the grades from sports competition, parades, behavior at mess hall and chapel, and tent cleanliness are tallied to announce the winner of the Plaque. Gov. Whitcomb’s emphasis on Christianity as part of the camp program continues to this day. Whether or not campers consider themselves religious, they routinely report that the Camp chapel services, especially Evensong on Sunday night, are among their strongest and most lasting camp memories. As was sung at the first graduation, “Now the Day is Over” is the final hymn sung on the last day of Camp and the tears flow just as much today as they did then. 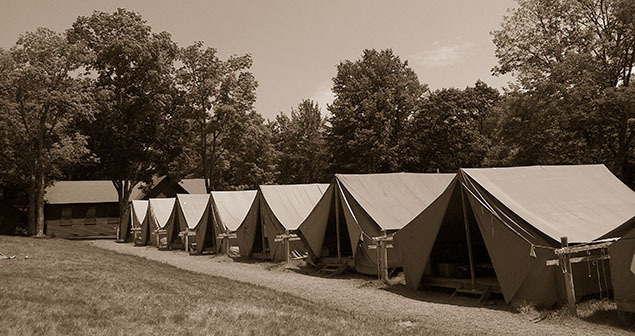 We treasure these Camp traditions that continue to resonate with today’s campers. We have found that our camp program, developed 100 years ago, continues to help boys develop the core values and character needed to become upstanding young men today.